The coin toss came up tails. The Phillies lost again — a familiar sight over the past week. In the umpires’ locker room before the game on September 30 in Brooklyn, Baseball Commissioner Ford Frick flipped a coin. In the event the Dodgers won both of the final two games of the season against the Phillies, the two teams would be tied for the National League pennant. The teams would have to play a best-of-three playoff series to determine who would play the New York Yankees in the World Series. If the coin came up heads, Philadelphia would host the first game; tails would be the Dodgers. It was tails, meaning the Phillies would have to stay in Brooklyn to play the first game of the series.2 No one had thought a coin flip would ever be necessary just 12 days prior. When Phillies fans awoke on September 18, their team was in first place, 7½ games in front of the Boston Braves, and nine games in front of Brooklyn. Now, 12 days later, the Whiz Kids’ lead had shrunk to a slim two games over Brooklyn, which had since leapfrogged over the Braves. The Phillies had just been swept in back-to-back doubleheaders by the New York Giants and were 3-8 over that stretch. Meanwhile, the Dodgers had just swept a doubleheader from Boston and were 12-3 since September 18. The World Series dancing dreams of long-suffering Phillies fans were turned into wandering night terrors. The Bell Telephone Company’s new automated weather-reporting service was flooded with thousands of calls from fans inquiring about the weather in Brooklyn. Many of them received only a busy signal. Bell said the 187 trunk lines were unable to meet the demand.5 In a fact that befuddles the modern mind, if both games in Brooklyn were rained out, the Phillies would be the default champions and no makeups would be played. The Dodgers knew that even with a Saturday win, a Sunday washout would still give Philadelphia the pennant.6 Philadelphia fans might just as easily have been hoping for a soaking rain as they were a sizzling team on the basepaths. Miller had begun the year 8-0 and drawn comparisons to Dizzy Dean, but had struggled since injuring his back midsummer.10The Dodgers had something going in their half of the first inning after two were out. Duke Snider grounded to shortstop, but Granny Hamner’s throw pulled Eddie Waitkus off the first-base bag for an error. Snider advanced to third on Jackie Robinson’s single. Robinson attempted to steal second to entice a throw from catcher Andy Seminick, but Seminick would have none of it. He instead snapped a throw to third, and picked off the overeager Snider to end the inning. The Dodgers threatened again in the fourth inning, as Snider beat out an infield single and Robinson doubled him to third. Carl Furillo grounded to Willie “Puddin’ Head” Jones at third, who threw Snider out at the plate for the second out of the inning. Gil Hodges then struck out swinging to end the inning and keep the game scoreless through four innings. In the fifth inning the Dodgers broke the scoreless tie with four runs. Billy Cox singled and with two outs scored on a single by Cal Abrams. Pee Wee Reese tripled to the center-field exit gate, scoring Cox and driving Miller from the mound. Phillies manager Eddie Sawyer brought in Jim Konstanty, who was making his league-leading 74th relief appearance of the year. He was greeted by Snider’s 31st home run, which Burr described as “over the chicken wire in right field and into Bedford Ave.”11 The Dodgers led the reeling Phillies 4-0 headed into the sixth inning. Palica cut off the relay throw, but his attempt to throw out Sisler at third resulted in a wild throw that rolled to the stands, where a fan reached over the railing and grabbed the ball. Umpire Larry Goetz signaled interference and Sisler scored, while a policeman escorted the fan out. The Dodgers’ lead was cut to 4-3. 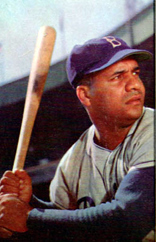 Jones walked, but Roy Campanella threw him out attempting to steal, preventing further damage. Seminick drew a leadoff walk in the Phillies’ seventh inning, but the Dodgers turned a double play, Reese to Robinson to Hodges, to end the threat. The Dodgers had claimed another victory, and were now a single game behind the Phillies with one game to play. This was Brooklyn’s 13th win in 16 games, while the Phillies endured their eighth loss in 10 games. 1 Harold C. Burr, “Dodgers Baffle Best Minds in Boro,” Brooklyn Eagle, October 1, 1950: 27. 2 Frick was carefully observed by Robert R.M. Carpenter Jr., the Phillies’ president, and John Collins, the Dodgers’ business manager. “Playoff Setup: 1 There, 2 Here,” Philadelphia Inquirer, October 1, 1950. 3 Stan Baumgartner, “Brooks Win 2, Stay in Race; Idle Yanks Clinch Pennant,” Philadelphia Inquirer, September 30, 1950: 15. 4 Stan Baumgartner, “Dodgers Beat Phils, 7-3, Move One Game From Tie,” Philadelphia Inquirer, October 1, 1950. 5 “Phils’ Fans Jam Weather Service,” Philadelphia Inquirer, September 30, 1950: 1. 6 “Weatherman All Wet — He Thinks It’ll Rain,” Brooklyn Eagle, September 30, 1950: 6. 7 Sig Frigaud, “Boro Fans See Visions Very Bright and Gay,” Brooklyn Eagle, October 1, 1950: 3. 8 The October 2, 1950, Brooklyn Eagle reported that Brooklyn had drawn 421,514 fewer fans than they did in 1949. 9 Robin Roberts and C. Paul Rogers III, The Whiz Kids and the 1950 Pennant (Philadelphia: Temple University Press, 1996), 310. 11 Harold C. Burr, “Dodgerdom Awaits Today’s Game With Bated Breath,” Brooklyn Eagle, October 1, 1950: 27. 12 Burr, “Dodgerdom Awaits,” 27. 13 “Quiet Confidence Grips all Brooks,” New York Times, October 1, 1950: 160. 15 John Webster, “Hope for Phils — Never Lost 6 Straight Games in 1950,” Philadelphia Inquirer, October 1, 1950: 8.